Germans Brainstorm are a well-known entity. They have been reliably delivering power metal album after power metal album for years. Midnight Ghost happens to be their 12th full length (if my count is correct), and pretty remarkably they have done it largely with the same lineup. Many of these points made me think of a soccer analogy when listening to Midnight Ghost. Far from being the team I dislike, I canâ€™t call an utter fandom for Brainstorm here either. Instead, I have an understanding and respect for the style of metal they play. They have their brand, and even if it isnâ€™t my personal favorite, I root for them to deliver the goods. 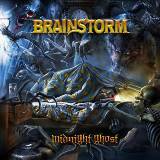 The aforementioned Brainstorm brand, the meaty power metal with a hint of darkness, is the theme on Midnight Ghost, evident from the very first track Devilâ€™s Eye, and pretty much consistent throughout the album. I guarantee you that melodic bridge and hooky sing along chorus of Devilâ€™s Eye will stay with you for a while. From there, signature syncopated yet flowing riffs and engaging rolling double bass chorus of Revealing the Darkness, OCD bouncy off the walls rhythm of The Pyre, something that reminded me of Tear Down the Walls all the way from Ambiguity - many of the first half tracks on Midnight Ghost speak of seasoned veteran quality and promise an enjoyable listen. Some vignettes in the form of keyboard touches and intro of Ravenous Minds, flying speed guitars in The Pyre, epic historic grandiose Jeanne Boulet (1764) with its rainy acoustics, bells and closing hymnal folk melody provide a change of pace, and Ravenous Minds affords that recognizable opening in guitars for Andy B. Frank to dominate with his immediately identifiable voice. Second half of Midnight Ghost levels for me a bit. Divine Inner Ghost is another piece of that darkened catchy power metal, and the music is still not boring and easy to listen to throughout, but When Pain Becomes Real and The Four Blessings just donâ€™t have that grabbing power, and even if Haunting Voices can be called a recovery, The Path, the slower more romantic deliberative tune doesnâ€™t breathe the excitement back into the album. Donâ€™t get my criticism too close to the heart, if you are a dedicated Brainstorm fan. As I said at the beginning, their style, although worthy of respect, is not something I would go to on a daily basis from my CD collection. I own pretty much every Brainstorm album through Liquid Monster, but after that I got a little detached. Add 10 points if you own every one of Brainstorm albums beyond that, and also add Midnight Ghost to your collection.